I have set conditional logic: If payment, "check-to be mailed" is filled, show "Make the check payable to ...". 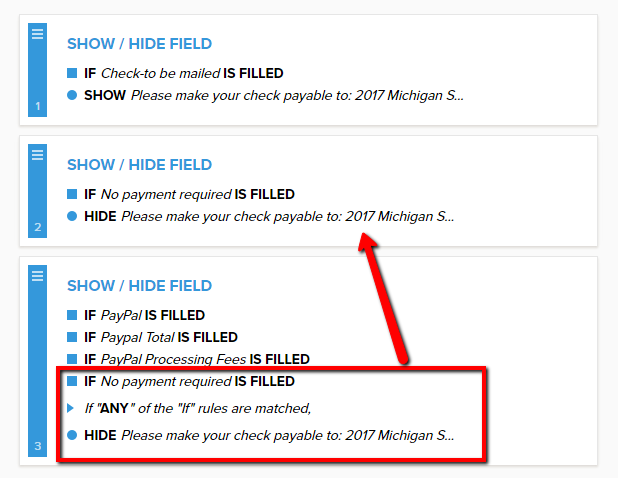 However when "check-to be mailed" is filled, the instruction "Make the check payable..." does not show. I have reviewed your form and noticed that the third condition is the one that has conflicts. I also noticed that your second condition is not required as it is already part of the third condition. In your third condition, you are verifying the Paypal fields are filled or not. This fields will never be empty as they are calculation and payment gateway. They will always contain at least a "0" value.